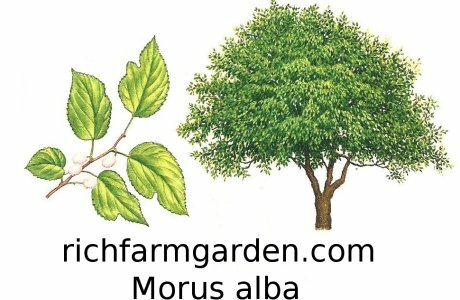 Russian Mulberry - Morus alba tatarica - Dense rounded top tree with bright green leaves and elongated purple fruits used for jams, jellies and wines. Often used as windbreaks or to draw birds from orchards. Makes a good shade tree and grows fast. Full sun or partial shade; Hardy to -30F(-34.4C); height: 40ft.